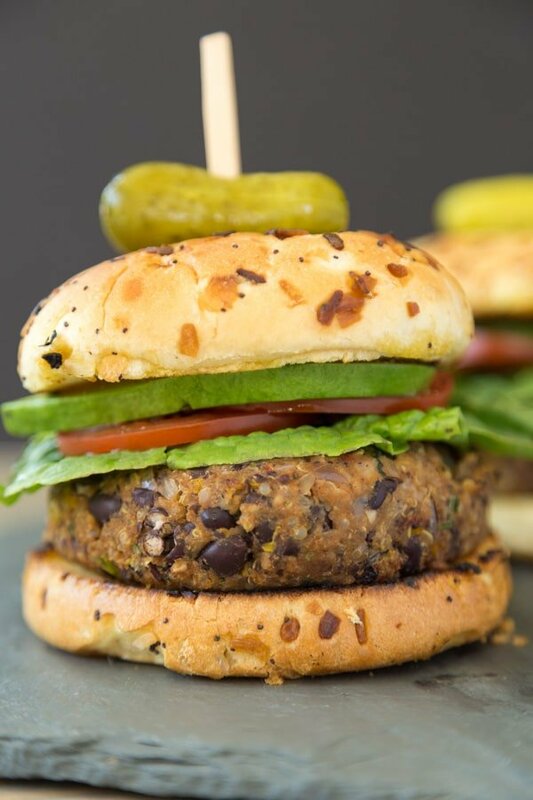 Smoky, spicy black beans and quinoa burger, crispy on the outside and tender on the inside, exactly what a veggie burger should be. Made with black beans, quinoa, bell pepper, red onion and more. 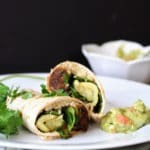 This recipe has been updated and it’s even better than the original. 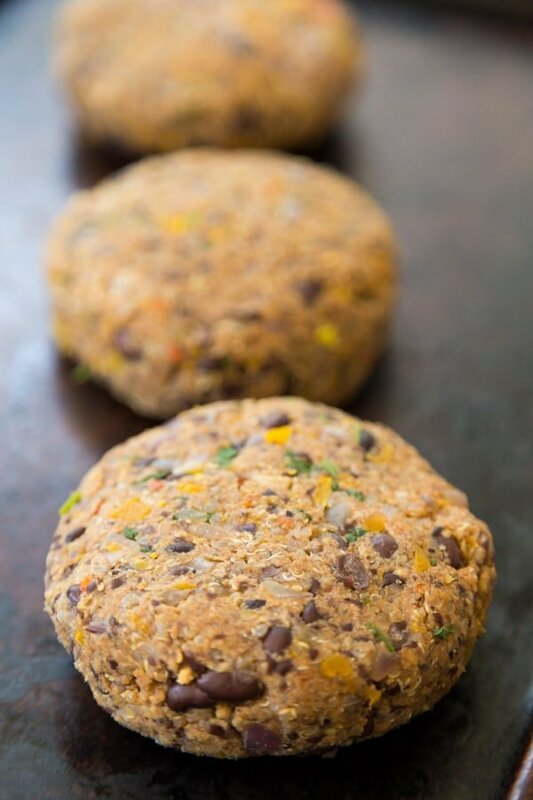 I apologize up front for torturing you with these mouthwatering pictures of our spicy black bean quinoa burgers. However, it was the only way I could think of to get your attention. Now that I have it, let’s talk about these delicious veggie burgers. They are perfect grilling burgers. Yep, for real, you can grill these, flip them, and not have to worry about them falling apart and disappearing between the grates. Unusual, I know. We experimented with a lot of binding agents to get to this point, and we did it! The secret to getting these black bean veggie burgers to stick together and stay solid is tapioca starch. Surprised? Don’t be, if anything you should ask us why it took us so long to figure this out. The idea came to me a few weekends ago when we were eating Chik’n and Waffles in Denver, CO at the AMAZING Watercourse Foods. I asked our charming server what the chef used as an egg replacer, because the waffles were so perfect. He so kindly went and asked, then proceeded to tell me it was tapioca starch. This totally triggered a light bulb moment. I mean, I’ve used tapioca starch to make vegan mozzarella and it was the ingredient that turned watery cashew cream into thick and stretchy mozz. Of course it would make a fantastic binder! This is a game changer, my friends. It works better than flax eggs, aquafaba or any other binding agents I’ve used in veggie burgers. Life just keeps getting better and better. 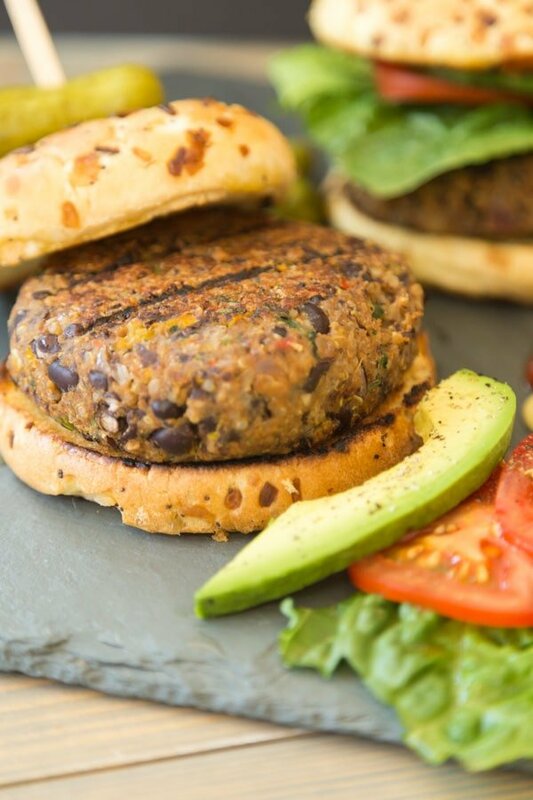 You’re going to love our homemade spicy black bean burger recipe. They’re perfect for summer BBQ season and they’re also great if you make them in a hot skillet in your kitchen. You can prepare them ahead of time and freeze them, and they’re sturdy enough to wrap up and take to a party at a friend’s house. All right, enough talking, let’s start cooking! First – Finely chop or pulse the veggies in a food processor until they look like confetti. Cook them in a hot pan (no oil needed) for approximately seven to ten minutes, or until they soften and release their water. It’s important to dry out the veggies so the burgers don’t crumble. Even with the excellent binding agent in this recipe, wet vegetables make a mushy and wet burger. Yuck! 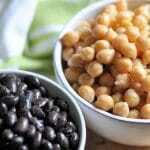 Second – While the veggies are cooking, drain and rinse the beans and put three-quarters of them in a food processor and process until they form a ball. Put them in a large mixing bowl with the remainder of the beans. Third – Mix the tapioca starch with water and whisk until smooth. Fourth – Add the vegetables, quinoa, breadcrumbs, spices, salt and pepper and tapioca mixture to the beans and fold until completely combined. Let it chill for an hour so it sets. Fifth – Form into patties and grill or sear in a skillet. Build it into an epic burger and dig in. Serve these delicious spicy bean burgers with our home fries and a fresh cucumber, tomato and mint salad. If you’re cutting back on carbs, wrap up that burger in a large piece of crisp lettuce or top it with smashed avocado and a drizzle of sriracha. 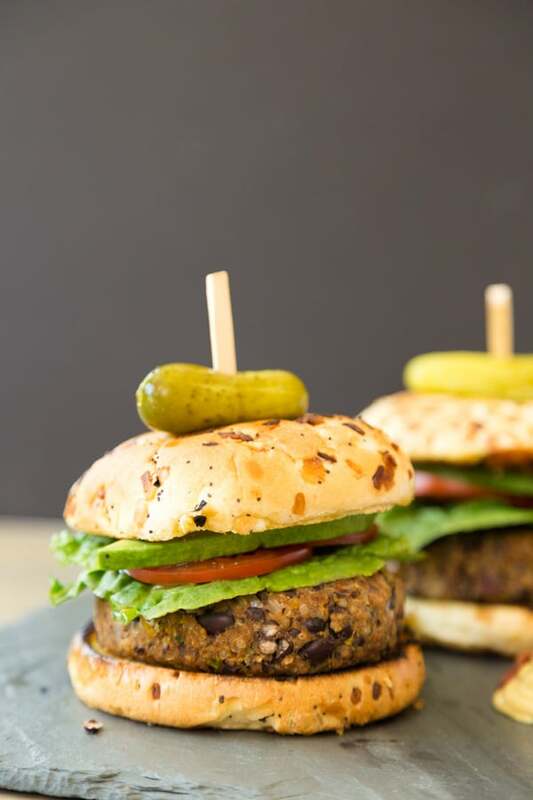 Make our spicy vegan black bean and quinoa burgers and let us know what you think. Don’t forget to take a picture of your delicious creation and tag us @veganosity on Instagram. 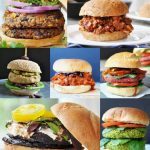 Get ready for BBQ season with our awesome cookbook, GREAT VEGAN BBQ WITHOUT A GRILL! 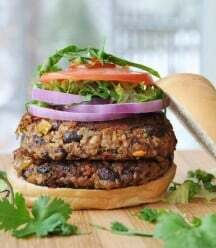 Smoky, spicy black beans and quinoa burgers. Crispy on the outside and tender on the inside, exactly what a veggie burger should be. Finely chop or process the bell pepper in a food processor and put in a hot skillet. Spread evenly throughout the pan. Finely chop or process the onion, garlic, chili pepper and cilantro and add to the pan. Stir to combine with the bell pepper and cook for approximately 7 to 10 minutes, or until the vegetables release their water and they begin to dry out. You don't want wet and mushy vegetables in the burgers or they will fall apart and the texture will be mushy. Put 3/4 of the beans in a food processor and blend until they begin to form a ball. Put in a large mixing bowl with the whole beans. Transfer the vegetables to the bowl with the beans. Add the quinoa, breadcrumbs, spices and liquid smoke to the bowl. Combine the tapioca starch and water and stir until it’s a thick and sticky consistency. 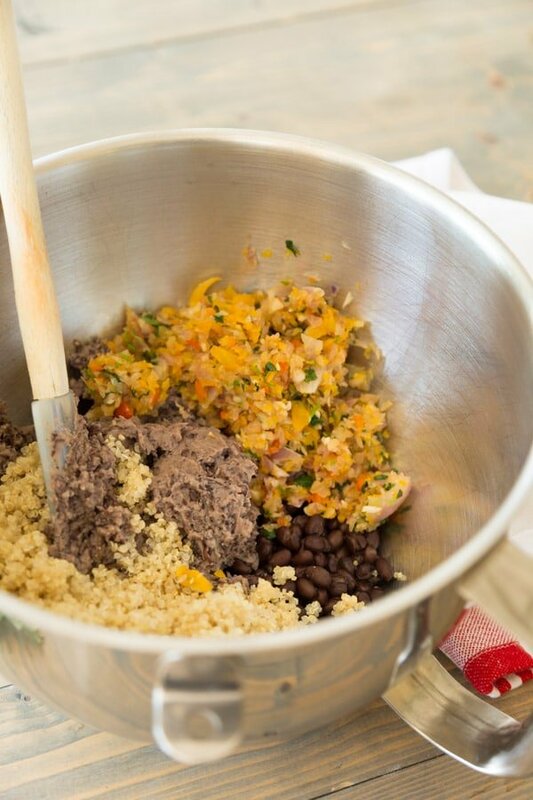 Pour into the bowl with the beans, veggies, quinoa and breadcrumbs and stir well to combine. The texture should be thick and very sticky. Scoop out a 1/2 cup of the mixture, roll into a ball, then pat into a patty. Heat large skillet on medium-high heat, add the oil and spread it evenly throughout the pan. Add the burgers (as many as will comfortably fit the pan, you may have to cook in batches) and cook for approximately 3 to 4 minutes or until they’re nicely browned. Use a spatula to gently flip and cook the other side for the same amount of time. For best results cover the burgers with a lid. Put on a bun and top with the lettuce, tomato and avocado slices. Homemade bean burgers are not the same as store bought. They need to be handled with care or they may crack. Also, canned beans can be inconsistent in texture. Some are super dry, so if that's the case you should add a little water to make the patty more cohesive. You may freeze the patties in a freezer proof container for 1 month. I made these burgers and the flavor was great, however they were really crumbly...They formed well, but when flipped cracked and nearly fell apart. Not much of a patty, more like sloppy joe style. What is the trick in a firmer patty? Thanks! Hi Sarah, I'm sorry that happened. You have to process the mixture until it forms a ball, it should be really sticky. However, like most homemade bean burgers, they need to be handled with care or they will crack. Also, canned beans can be inconsistent in texture. Some are super dry, so if that's the case you should add a little water to make the patty more cohesive. Do we put all the quinoa in the mixture? 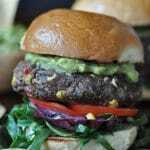 No where in this recipe did it mention WHEN to add the quinoa used in the burger. Hey Jasper, sorry about that. You add it with the beans and the breadcrumbs. That's great that you can actually grill these burgers! Usually when I make homemade burgers, I have to stick with the indoor grill pan. How interesting about the tapioca starch. I love Watercourse! I'm envious that you got to go recently. I haven't been there in a few years. Hey Cadry! We've grilled veggie burgers in the past, but you have to be so careful when flipping them. These work perfectly, thanks to the tapioca starch. Yes!! Watercourse is awesome, I can't wait to go back. 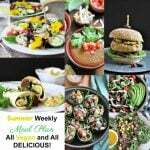 Seriously love your recipes, ladies... and the pictures are so perfect, as always :) Really craving this burger now! Thank you so much, Alena! We're so happy you like the recipe and appreciate your kind words. Oh, hello veggie burger HEAVEN! Wow! 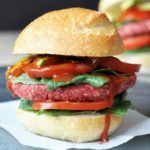 This recipe is everything I love in a great veggie burger; I can't wait to try it out this summer! I'm going to have to try tapioca starch next time. I haven't used it as a binder in my burgers either...will keep you posted. You'll love it! It's really the best binder I've used yet. What a great looking burger Linda! I'm totally bookmarking this recipe to make it for later. I'm sure the whole family will love it! Hey Tania! Thank you so much! Please let us know what you and your family think. I made these this past Sunday and it was amazing! I added some spices (I like spicy) and paired it with a vegan cream cheese I made and the flavors complemented each other nicely. Amazing recipe! Thank you for posting this. Hi Alex! Yay, we're so happy to hear it. We love that you're a fellow spicy food lover. If we wrote our recipes with the amount of spice that we use in our own food, most of our readers would hate us-lol! Thanks for taking the time to let us know how much you liked them. Looks good. In the middle of making this, I realized the recipe says 30 oz black beans? I think I am missing something. There is only 8 oz in a regular can, so that means 5 cans? Oops, I type faster than I think ;) I mean 4 cans. Hi Cathy, great question! We use 2 (15 oz) cans or one 30 oz. If you only have 8 oz cans, then 4 would be just fine. Enjoy! These look delish and I can't wait to try. The recipe came up when I searched for flaxseed recipes, but I don't see flaxseed in the ingredient list. Am I missing something? Hi! Thank you! These don't have flax seed for the egg replacer, we use tapioca starch. They must have shown up in your search because I talked about how we used tapioca starch in place of flax seed. You can certainly add a flax egg to the ingredients if you like. It shouldn't change the results as long as you don't omit the tapioca starch. It really makes them stick together so well. Enjoy!! !